Tory leader David Cameron has said he will not be diverted from his "green" agenda by the economic downturn. In a speech at Westminster's Royal Horticultural Halls, he said Britain "can't afford not to go green". He called for rules ensuring all new coal-fired power stations include measures to trap CO2 and to encourage the development of "greener" cars. 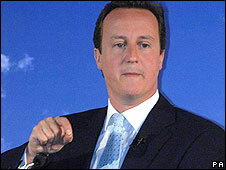 Environment Minister Phil Woolas said Mr Cameron provided "salesmanship, not leadership" on the environment. In his speech, Mr Cameron said he would not ignore the financial pressures on people, but would not drop his environmental agenda. And he said there were easy ways to encourage people to be more energy efficient - such as energy bills which allow each household to compare their gas and electricity bill with others. Fighting climate change was not a "costly diversion" and over-reliance on oil and gas was "bad for our national security," he said. "The era of cheap oil is well and truly over," he added. "So whether we need to cut our carbon or not- which we do, whether you believe in climate change or not - which you should, for the sake of our future prosperity and our current cost of living, we must wean ourselves off fossil fuels and go green." Mr Cameron said all new coal-fired power stations should have to include measures to trap CO2 emissions and said a Tory government would make researching tidal power in Britain a priority. He also promised to improve energy efficiency in the home, to encourage "micro-renewables" like homeowners' wind turbines and solar panels by paying them a guaranteed price for energy they create. And he pledged to draw up a long-term national transport plan aimed at aiding the economy and the environment - arguing that the government's arguments for a third runway at Heathrow airport fell apart under scrutiny. Green groups welcomed his commitment to emissions standards, which they believe would rule out developments like the controversial new power station planned for Kingsnorth in Kent. Keith Allott, WWF-UK's climate change spokesman said it would "avoid the risk of locking the UK into a high-carbon future" and could boost investment in carbon capture technology. John Sauven, of Greenpeace, said: "The Tories' proposals should have been more ambitious given what today's technologies can deliver but, by ruling out the proposed old-style coal plant at Kingsnorth in Kent, today's announcement puts Cameron way ahead of Brown when it comes to cleaning up our energy system." However Environment Minister Phil Woolas said Mr Cameron provided only "salesmanship, not leadership" on the environment. "The Tory leader continues to talk about introducing new green taxes 'on pollution' but still refuses to give any detail as to what they will be." He said the government was acting to make Britain "a world leader" on climate change. Later Mr Cameron and members of the shadow cabinet met US President George Bush - who is on the last leg of his European tour - at the US ambassador's residence. He described it as a "very productive meeting" which included discussion of concerns about the presidential election in Zimbabwe, free trade and Afghanistan. Is Cameron still keen to be green?